Pitmasters–the guys who actually do the smoky, sweaty work of tending the coals and cooking the pigs–are vastly underappreciated. There’s no better time than Labor Day to celebrate the pitmaster for what he is: one of the most important parts of any real barbecue restaurant (i.e., anywhere that still cooks over wood coals). Chop, chop, chop at the Skylight Inn. Photo by Conor "Swine Factor" Keeney. Interestingly, the owners of many barbecue joints start out as their own pitmasters, but upon achieving success most focus on the business side of the restaurant and delegate the hard work of cooking the pig to a full-time pitmaster. The Skylight Inn, one of the state’s finest swine establishements, is no exception. 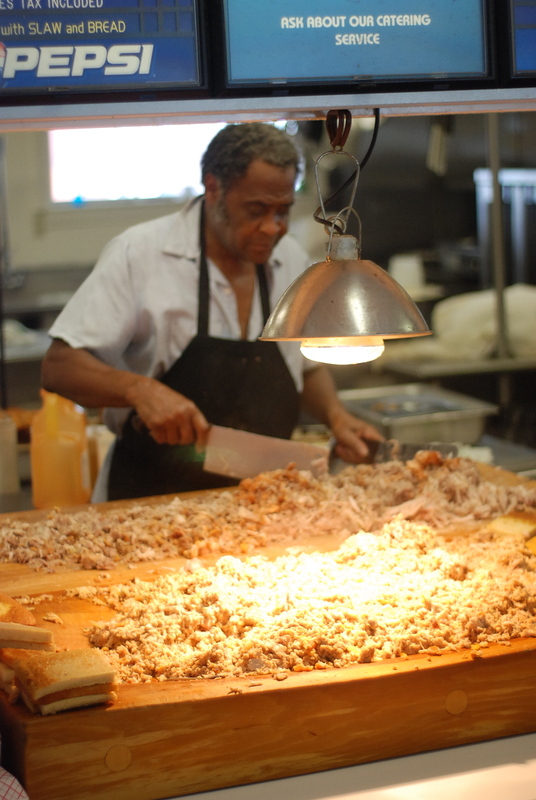 Though the Jones family comes from a long line of pitmasters and continues to play a major hands-on role in running the restaurant, the guy who shovels the coals and cooks the pigs has no relation to the Jones’. James Henry Howell, pictured here and featured–especially between the 8:00 and 12:00 minute marks–in the documentary Capitol Q, runs the pits at The Skylight Inn. As you can see, Howell also chops and seasons the ‘cue. Next time you are at The Skylight Inn or your favorite local joint, take a minute to say thanks to the pitmaster for enduring the long hours, the hot and smoky workplace, the modest pay, and the obscurity. He deserves some credit. Of course, barbecue joints aren’t the only places where the hardest work gets done by people who get little credit. In honor of Labor Day, take a moment to think about all the underappreciated, hard working folks who make your life a little better each day. Really nice tribute, Porky. I forwarded a copy to my favorite pitmaster Little Richard as a tribute to him. I told him to thank his crew (those unsung heros in the back) who roll in at 3 AM to fire up the pits and start that slow cooking process. As Little R would say “Eat ‘mo pig.” Happy Labor Day. Love that picture of the big butcher block loaded with BBQ. Is there any better sound that a cleaver whacking a big block as it chops up pork? One better sound… My lips smacking while eating it!! !